Modern viewers take for granted the pictorial conventions present in easel paintings and engraved prints of such subjects as landscapes or peasants. These generic subjects and their representational conventions, however, have their own origins and early histories. In sixteenth-century Antwerp, painting and the emerging new medium of engraving began to depart from traditional visual culture, which had been defined primarily by wall paintings, altarpieces, and portraits of the elite. New genres and new media arose simultaneously in this volatile commercial and financial capital of Europe, home to the first open art market near the city Bourse. The new pictorial subjects emerged first as hybrid images, dominated by religious themes but also including elements that later became pictorial categories in their own right: landscapes, food markets, peasants at work and play, and still-life compositions. In addition to being the place of the origin and evolution of these genres, the Antwerp art market gave rise to the concept of artistic identity, in which favorite forms and favorite themes by an individual artist gained consumer recognition. In Peasant Scenes and Landscapes, Larry Silver examines the emergence of pictorial kinds—scenes of taverns and markets, landscapes and peasants—and charts their evolution as genres from initial hybrids to more conventionalized artistic formulas. The relationship of these new genres and their favorite themes reflect a burgeoning urbanism and capitalism in Antwerp, and Silver analyzes how pictorial genres and the Antwerp marketplace fostered the development of what has come to be known as "signature" artistic style. 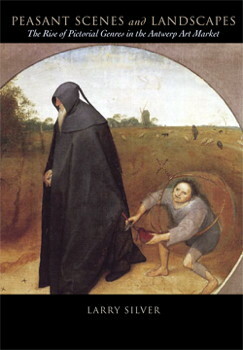 By examining Bosch and Bruegel, together with their imitators, he focuses on pictorial innovation as well as the marketing of individual styles, attending particularly to the growing practice of artists signing their works. In addition, he argues that consumer interest in the style of individual artists reinforced another phenomenon of the later sixteenth century: art collecting. While today we take such typical artistic formulas as commonplace, along with their frequent use of identifying signatures (a Rothko, a Pollock), Peasant Scenes and Landscapes shows how these developed simultaneously in the commercial world of early modern Antwerp.